Royal Air Force Air Cadets in Nairn are reaching new heights after their new flight simulator was commissioned into service. 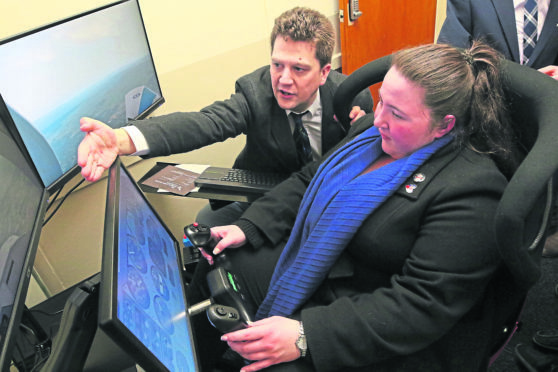 The sophisticated simulator will provide cadets with an accessible, flexible and regular method of ‘flying’ helping them to develop practical skills in the environment of a realistic cockpit of a Grob Tutor aircraft. During an official opening ceremony at the squadron on Friars Street this week, dozens of parents, cadets locals turned out to see Lord Lieutenant of Nairnshire George Asher unveil the new machine. Gliding instructor Sergeant Gary McIver said: “Being the Air cadets, aviation is obviously very important to us as an organisation. “The simulator gives us a better opportunity to be able to not only give them the theoretical side but the practical side as well. “We can take them into the simulator and physically show them this is what the cockpit looks like, this is what the instruments looks like, this is how it feels and all the sort of things you just can’t do from a book. For the last two years, the squadron has worked to raise the £3,800 needed to make their aspirations a reality, through a series of fundraising ventures including supermarket bag packing. Following support from both The Davidson (Nairn) Charitable Trust and The Gordon and Ena Baxter Foundation, the equipment was purchased and installed within 10 weeks. Having been flown to many places over the years, I have always been curious about what it would feel like to fly an aircraft. But when I was given the opportunity to attempt to fly a Grob Tutor aircraft through 1068 Nairn Squadron’s new flight simulator, it turned out I was quite nervous. Upon taking my position at the helm, I was given a brief outline of all the main controls and their functions including the speed indicator, the altimeter and the vertical speed indicator as well as number of basic controls which help steer the aircraft including the yolk, the throttle and the rudder pedals. Within a matter of minutes – slightly to my surprise – I was flying and in a straight line. The instructor showed me on how to make a number of manoeuvres including making the aircraft climb – by pulling back on the yoke – before bringing the aircraft back down to a safe altitude. I also accomplished a smooth left turn before levelling off again. The whole experience was a fantastic insight into life as a pilot and fulfilled one of my greatest curiosities. From the realistic graphics to the many different controls included within this impressive simulator, I can see why this state-of-the-art piece of equipment will help the young cadets of our generation take to the skies more experienced and confident in their own abilities.